Did you know someone solo crossed 6300+km on a windsurfer? I just found out this amazing story of Raphaëla le Gouvello, who did a solo 6300+km crossing. She sailed from Australia over the Indian Ocean to the Reunion Island! 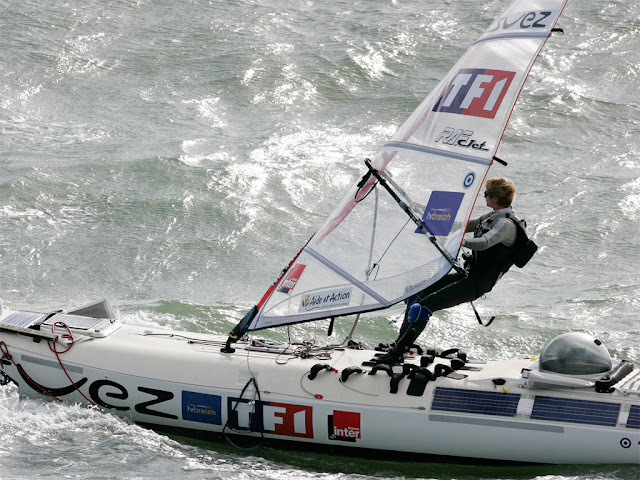 Raphaëla le Gouvello is 45 years old, a qualified veterinarian specialized in aquaculture (fish farming) and managing director of a company in Pénestin, Morbihan, and has always had several irons in the fire: first her studies, then her profession and her passion for windsurfing. She discovered windsurfing with her family in 1976 and has been an adept ever since: her first competitions date back to 1977 and she began teaching the sport to beginners in 1978. In 1982 she was the only woman participant in the 24 hour International Event at La Baule where she completed the event with 17 other participants out of 36 competitors.